When you contact technical support, the support engineer may request the full version number of your application to investigate the issue. To view the application version, right-click the application icon in the lower-right corner of the Desktop (taskbar) and select the command with the application name from the shortcut menu. If the application icon is hidden from the notification area, click the Show hidden icons arrow. The version number will be shown under the application name. 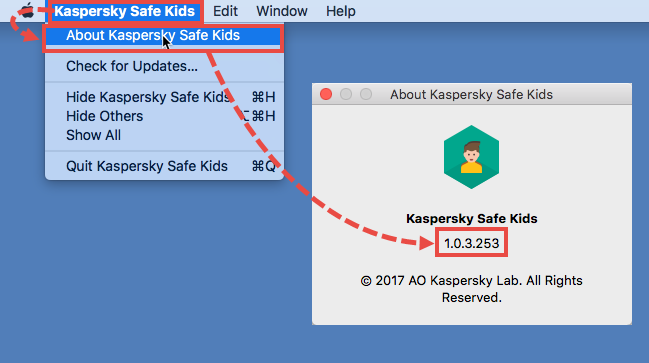 Open Kaspersky Safe Kids for Mac. In the upper-left corner of your desktop, click Kaspersky Safe Kids → About Kaspersky Safe Kids. The version number will be shown under the application name. Tap About. The version number will be shown under the application name. Scroll down and tap About. The version number will be shown under the application name.